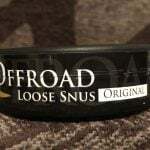 Produced by AG Snus as part of their U Sample lineup, U Sample No. 7 Arctic White is a spearmint flavored chewing tobacco which comes in a convenient portion format. 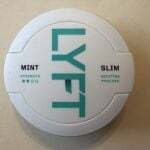 Due to the manufacturing process, you don’t need to spit like you would normal chew, and I recommend placing the portions in your upper lip for maximum satisfaction. I’ve previously enjoyed reviewing AG’s U Sample No. 5 Original, and so I was excited once I received a can of U Sample No. 7 to review and see how it compares! Every can of U Sample No. 7 comes with 20 portions, each containing 0.7 grams of extra strong chew for a total of 16.8 grams per can. Once I opened my can of U Sample No. 7, I was greeted with a sweet aroma of spearmint with slight hints of tobacco in the background. 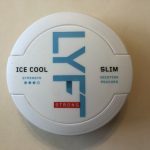 After trying a portion, I gave the chew a few minutes for the flavor to develop, and within five minutes I began to notice a sweet tasting spearmint flavor begin to dominate. The spearmint was quite natural tasting and wasn’t overly sweet, and this flavor lasted for about twenty minutes before slight hints of tobacco began to creep in. I began to notice a loss of the spearmint flavor around the half hour mark, and the chew became increasingly salty as time passed. The portion material is soft, and portions fit comfortably in my upper lip without any issues. 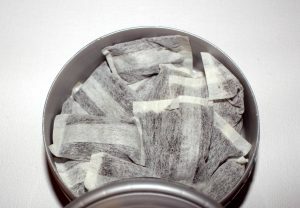 The chew is a white portion, and this makes the nicotine release more gradual, while at the same time extending how long you can keep a portion in for. On average, I generally removed portions a little before an hour due to a decline in flavor, but you could easily leave them in for longer without experiencing much drip. As a whole, I found that U Sample No. 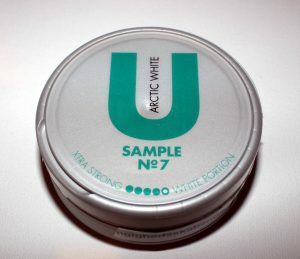 7 Arctic White was an enjoyable chew for those who prefer mint tasting chewing tobaccos. Moreover, the white portions made for a smooth nicotine release and fairly long lasting flavor, and I found myself putting in portions of U Sample No. 7 after as a refreshing post meal chew.